Parker! Parker! Get out there and get me some pictures of that menace! He tried to steal an Xbox One! Maybe that's news? What do I pay you people for?! OK, so, not really. It was a guy in a Spider-Man hoodie, the hood zipped into a mask around his face to keep his identity a secret, because people he loves could be hurt if people knew who he was. This happened up in Chesterfield Township, Mich. which is a suburb northeast of Detroit. It happened at 12:30 a.m. Central time on Friday, which is 90 minutes after the console's midnight EDT launch. So, unlike Bakersfield last week with the PlayStation 4 (twice!) 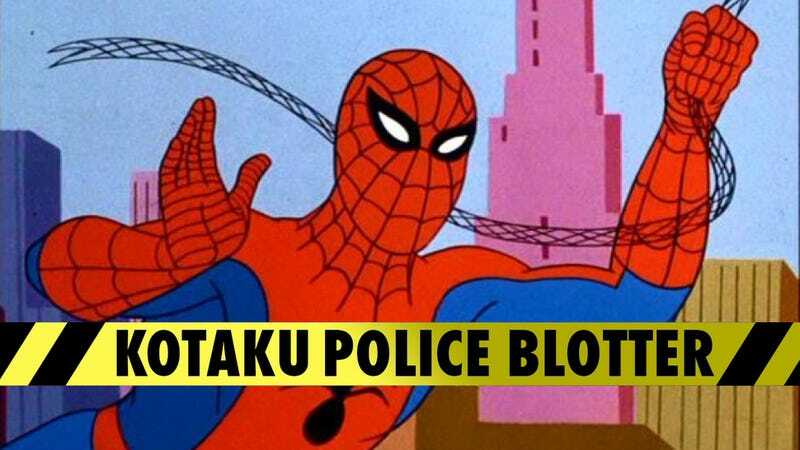 we can't call this the First Robbery of the Xbox One, because Spidey didn't get the goods. Two sisters say they saw a man lingering by the exit of a Meijer store. As they walked by him on the way to their car, he came up from behind, with the hood zipped into a Spider-Man mask. He demanded the Xbox One console they'd just purchased. The sisters replied, more or less, "are you serious?" This despite the fact one said she saw the barrel of a gun in the man's hand. Spidey looked at other shoppers leaving the store, shoved his hands in his pockets and ran to a getaway car. Police in Chesterfield Township made an arrest at 3 p.m. Friday of a suspect they have not yet named—though they do note they have a Spider-Man hoodie in evidence.